AWG - American Wire Gauge - is an U.S. standard for wire conductor size. 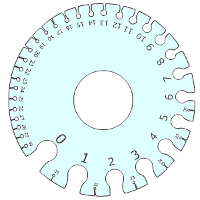 The "gauge" is related to the diameter of the wire. The table below can be used to convert American Wire Gauge (AWG) to square mm cross sectional area. Note! - the diameter of a solid and stranded wire with the same AWG is not identical. The diameter of a stranded wire is larger than the diameter of a solid wire. Engineering ToolBox, (2004). Wire Gauge Converter - AWG versus square mm . [online] Available at: https://www.engineeringtoolbox.com/awg-wire-gauge-d_731.html [Accessed Day Mo. Year].